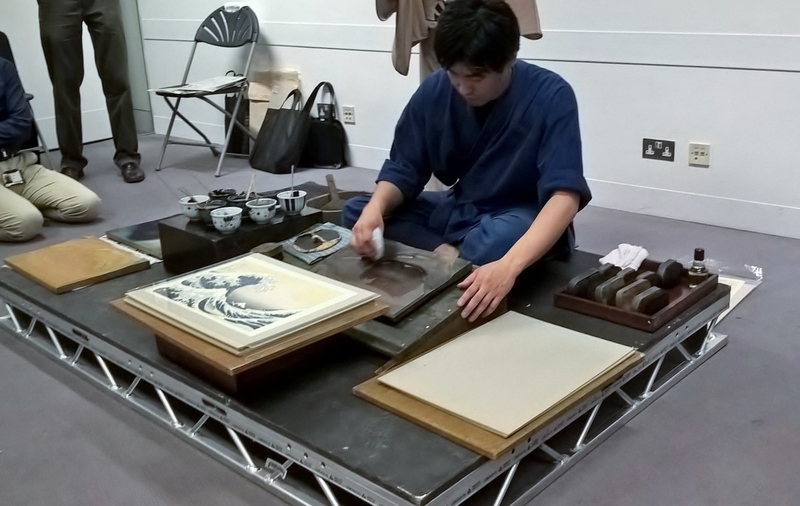 demonstration of the traditional Japanese woodblock printing process, I would not let it go unrecorded. It was most interesting to compare Japanese practice to my own attempts to work in the Western tradition. The demonstration was held on the 1st of June 2017, in the Sackler Rooms at the British Museum. Tim Clark, curator of the new exhibition”Hokusai: Beyond the Great Wave” * introduced the session. He introduced the printer, Mr Soda, and the narrator, Mrs Takahashi, of the old established Tokyo printing firm Takahashi Studios. Alfred Haft translated from Japanese to English. The work area was a low dais featuring a sloped wooden worktable with small pads at each corner and beyond this was a stack of boards made of paperboard. To the right hand side, some seven or eight china pots side standing on a low drawer unit. Each pot had a brush in it. Behind the unit was a small wooden bucket containing a large flat horsehair brush. On the printer’s left hand lay a shallow tray with a selection of different sized brushes that looked to Western eyes like shoe- or scrubbing brushes. There was also one small pot of liquid. The young printer sat cross legged before his workstation. Further out from the working area were displayed seven woodblocks, stained with colour from previous use. 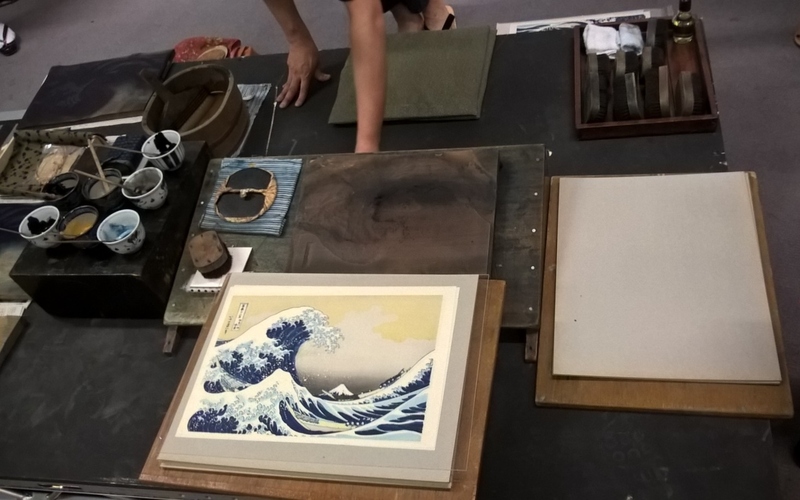 Mrs. Takahashi explained that although it was more usual to edition 100 prints at one time, for the purpose of the demonstration Mr Soda would produce 2 facsimile prints of Hokusai’s world famous print “Under the Wave at Kanagawa”, better known as The Great Wave or “Fuji Wave”. It was also a suitable print for this limited time session, since this image contains only 8 colours, whereas 15-16 is more the norm. As she spoke, the printer had been applying some fluid from the left hand pot to the baren** and then rubbing it on a cloth. He also brushed some water from the bucket across the boards. We found out that inside these boards was the mulberry paper that would be used for the prints. Having made these preparations, Mr Soda then took the first block. Made like the others from traditional mountain cherry, this first one was the most important – the keyblock. All the outlines of the design had been carved on this one. Having primed the block with some water, so that the ink does not over absorb into the block, he then placed it on to the slope . First dabbing some ink with a narrow brush onto the block, he then took one of the “Scrubbing” brushes and gently but firmly spread the ink all over the block. It was explained that the ink is a mixture of pigment and “Nori” paste which prevents colour bleed. Mr Soda set the brush aside and took a sheet of dampened paper. 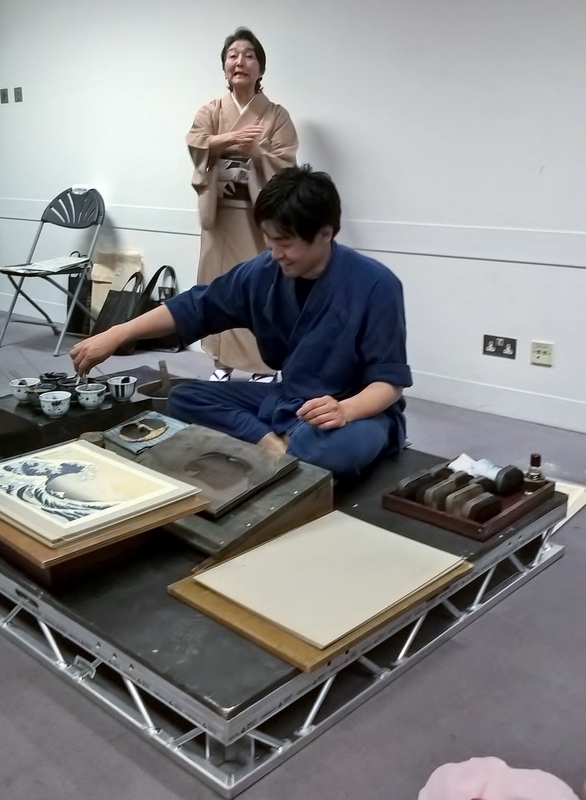 Placing the bottom corner and edge carefully up to the kento registration marks, the paper was laid on to the block and he began to rub the back of the sheet with the baren. The pressure was applied well, and the audience could see the image appearing through the back of the sheet. The result was a monochrome outline image of “The Great Wave” . After this, blocks for different colours were used in turn. For these, the colour was applied only in a targeted area. It was interesting to learn that the slope is deliberately angled away from the printer, since he can apply better pressure whilst avoiding too much strain to his arm. From time to time the baren needs re oiling and a good way of putting just enough on, is to pass it over the printer’s cheek so it can pick up some natural oil from the face. 8. Darker grey. The last colour had a special extra wiping process; this was to achieve gradation in the sky. After this last inking was completed, we admired the finished work. The accuracy of registration and purity of the colours were thrilling. Mrs. Takahashi responded to some questions at the end of the session. We learned that young printers serve a 7 year apprenticeship. The baren is made from bamboo leaf covering a tight packed layer of 40 sheets of paper, lacquered together , and that many sizes and weights are available. My own unspoken question was about the long term effect of water based ink on the wood block. It turned out that every 200 prints, the block must be set aside for a week to recover, and that eventually they absorb too much moisture to be reused – at this point they are planed down. The final question was regarding storage. Woodblocks are stored in newspaper for three reasons: Firstly, the ink of the newsprint is insecticidal; secondly, it absorbs moisture; and thirdly, the date on the paper tells you the age of the block. The session ended with a round of warm applause for the skill of the printer, and for the narration and translation which opened a window onto this example of Japanese genius. *”Hokusai:Beyond the Great Wave” at the British Museum until 13 August. Recommended. **Baren: Presses are not used in the Japanese tradition – the baren is a flat round tool made to apply pressure and transfer ink from block to paper.